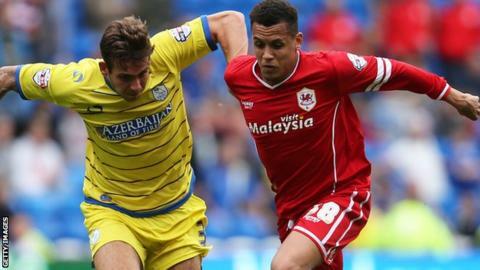 Cardiff City manager Russell Slade says he has not yet made a decision regarding the futures of midfielders Ravel Morrison and Kim Bo-Kyung. South Korea international Kim, 25, made his first league start and Morrison came off the bench in Saturday's 0-0 draw against Rotherham United. Morrison is on loan from West Ham until after the Boxing Day match away against Charlton Athletic. "We'll make a decision on that in due course," said Slade. Ex-Manchester United trainee Morrison, 21, has made four substitute appearances for Cardiff since Slade took over in October. His appearance against the Millers was his first since the Bluebirds' 3-0 defeat away at Bolton on 4 November. Kim meanwhile earned his first start under Slade after impressing for the club's under-21 side on Monday. Slade, who was asked if Kim has a future at the club, said: "We've still got a little bit of time before the January window." With injured winger Anthony Pilkington (hamstring) out for three to four weeks, the Cardiff boss says there is an opportunity for players to stake a claim for the Republic of Ireland international's shirt. "Kim Bo...really won the shirt with the way he played on Monday and the way he trained this week," said Slade. "He claimed that shirt so we'll wait and see if he did enough to hang onto it. "Obviously Kim Bo got the shirt but it's an opportunity for someone to grab it." Cardiff failed to win at home for the first time in six matches against newly promoted strugglers Rotherham on Saturday. Italian striker Federico Macheda had the Bluebirds' best and only real chance of the match, but his shot was saved by Millers' goalkeeper Adam Collin. Despite the lack of creativity, Cardiff recorded their third clean sheet in four matches and are now two points off the Championship play-off places in ninth. Their next game is away to third-placed Bournemouth on Saturday, 13 December. "That will be a difficult game for us," said Slade. "But sometimes when those games come along we show what we are capable of as we did last week against Watford."